Previous PostSri-Lanka Cookery: Mallum a form of greensNext PostRoasted Beetroot Pasta, It’s Pink! Your plan is inspiring!! I haven’t made my list yet but have to set about it as I have a big eater heading home from a six month tour of Afghanistan – where has been fed very well!! I’ll need to keep up the standard, which I look forward to anyway because I love food and cooking!! I might pinch some of your ideas and one or two of your recipes! Thanks so much for your fabulous blog!! 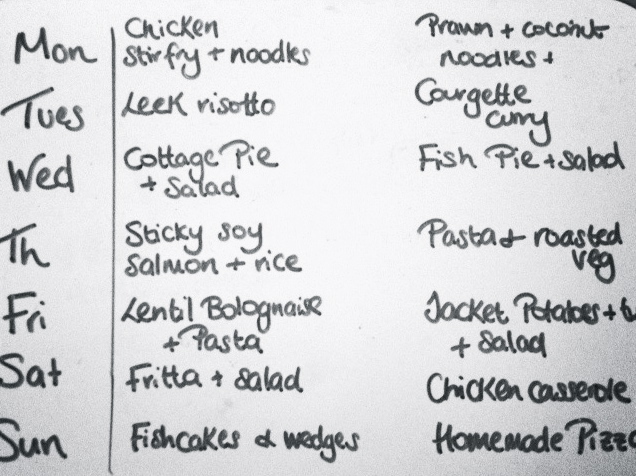 We would die of starvation or live on toast/takeaway if I didn’t plan meals. The family would cease to function. I make our plans fairly flexible, use the slow cooker on my long days at work or plan a 30 minute meal to whip up on my return, and put the more time consuming meals at the other end of the week. 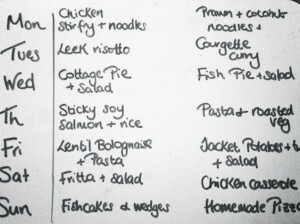 Weekends I try and make sure the meals are simple so that my husband, or even the children, can prepare them. This doesn’t always work, but for the most part, we make it work relatively well for us. I am enjoying your slowcooker pinboard on pinterest as I would like to vary the meals I cook on work days. Like you Dee, our plan is always flexible and I must admit it changes as the week goes on, it’s organic, it’s alive, it flows with us. Now if only I can take a leaf out of your book and get the husband to cook more….here’s hoping! I am very lucky. My husband does a good roast dinner. He also makes a decent risotto. I like to cook things like bolognese (lentil or meat), tagine type meals (even though I don’t have an actual tagine), lasagne (courgette or meat), and variations on chilli (bean versions, pork and chorizo versions and chunky beef). Your family are VERY lucy to have you. My hubby can do beans on toast, cheese on toast, pasta and pesto….and risotto at a stretch, well that’s all he pretends he can do. Give him a recipe book and he can do much, much more. I have been thinking (on & off for about 10 years now) about becoming a dietitian, but the qualifications & courses are all so expensive and I don’t know which one to do – are there any that are more recognised than others? Thanks for the info Priya – I’ll have to look again at courses…. 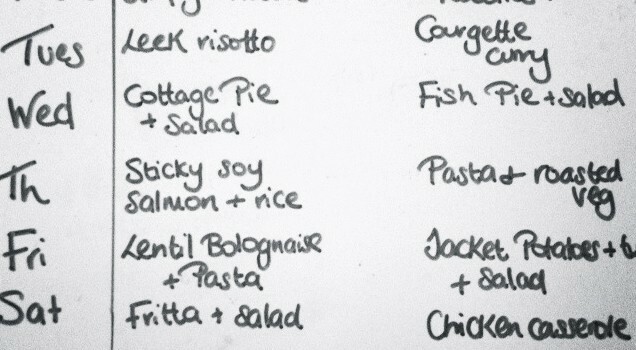 If I didn’t meal plan I’d never get out the supermarket and the meals would be really weird combinations. That’s if there was enough food to last the week. Hi Nicola, thanks for your comment. I’ve made some weird combinations in my time 😉 I find meal planning takes the stress out of things. Healthier is always better, there are lots of recipes and tips on my website.